Best cheesecake ever? So good you’ll cry? One million times better than any restaurant? 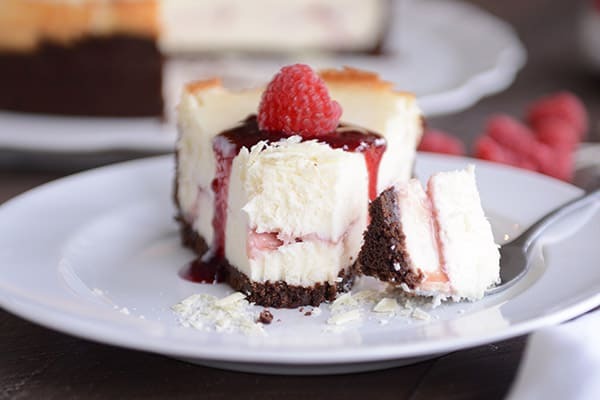 Those are all the feels (and more) when it comes to this amazing white chocolate raspberry truffle cheesecake. 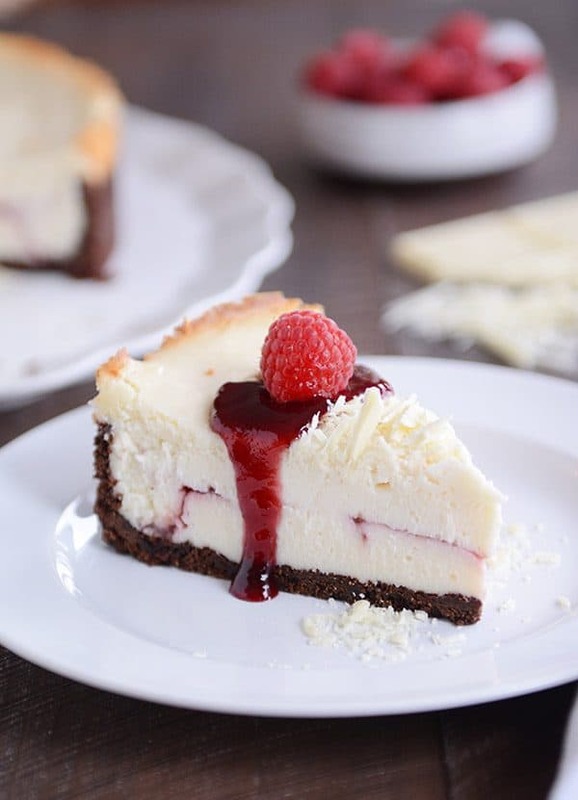 Today, it’s all about this white chocolate raspberry truffle cheesecake. Have you seen anything so decadent, so pretty, so delicious? Seriously, this amazing dessert is the perfect culmination for all the other holiday recipes (and everyday recipes!) I’ve shared the last few weeks. And as one who has eaten more cheesecake in a lifetime than I should willingly admit, this raspberry truffle number has solidified a spot in my top favorites of all time. Modeled after two of the most popular cheesecakes on my site*, this version is equally as delicious as those standouts. 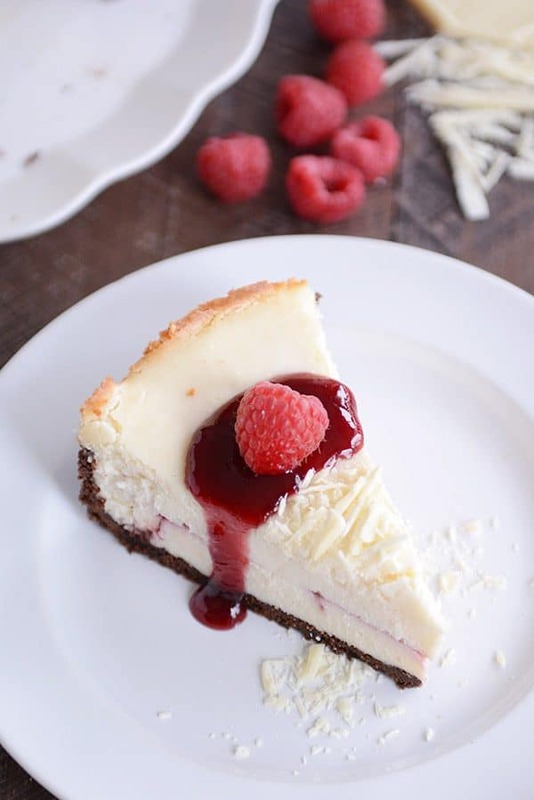 If you haven’t made or tasted either of those cheesecakes, this might look like your every day white chocolate raspberry truffle cheesecake (WCRTC). But in reality, that rather unique (and decadent) cheesecake batter is what sets this cheesecake apart from all other WCRTCs. Egg-free, the cheesecake batter benefits from the luxurious white chocolate ganache folded in at the end (or in simpler terms: white chocolate and heavy cream melted together). Not only does that component elevate the creamy factor, it also lends a velvety texture to the already rich and luscious cheesecake. I didn’t even realize what I had been missing out on until I learned you could make cheesecake this way (no eggs?? white chocolate in the batter??). 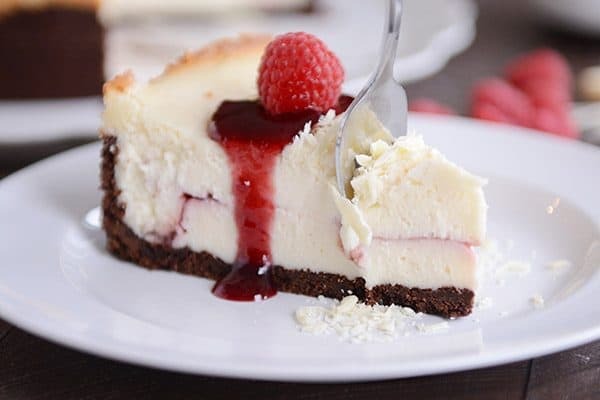 This white chocolate raspberry cheesecake (and the aforementioned peppermint and vanilla bean versions) are some of the best cheesecakes of my life, and they have ruined me to other more classic cheesecake recipes. 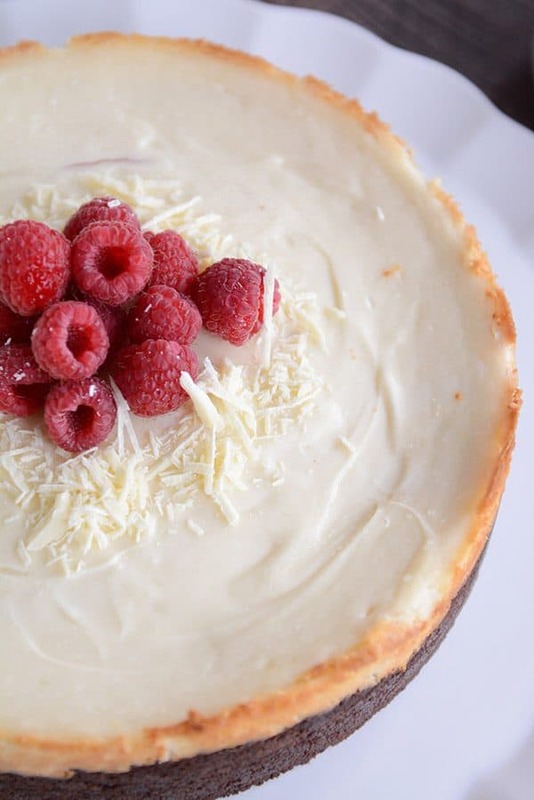 Despite it’s over-the-top appearance, this white chocolate raspberry truffle cheesecake is just as easy as any other cheesecake out there (maybe even a bit easier, actually!). Dollops of seedless raspberry jam. And then white chocolate shavings and raspberries to garnish it all up. You can make the appearance as fancy or as simple as you like. And several components of this recipe are pretty adaptable. Exhibit A: Pile it high with white chocolate shavings and fresh raspberries OR leave it plain and unadorned. Exhibit B: I opted to use storebought seedless raspberry jam in the recipe – both for convenience and because I wanted to avoid raspberry seeds for looks and texture. But you can definitely use raspberry jam with seeds or use the quick recipe in the notes of the recipe for a homemade raspberry sauce. Exhibit C: I made this in my 9-inch springform pan (linked below), but you could definitely use a 10-inch springform pan (obviously the cheesecake won’t be quite as tall and the crust not quite as thick). 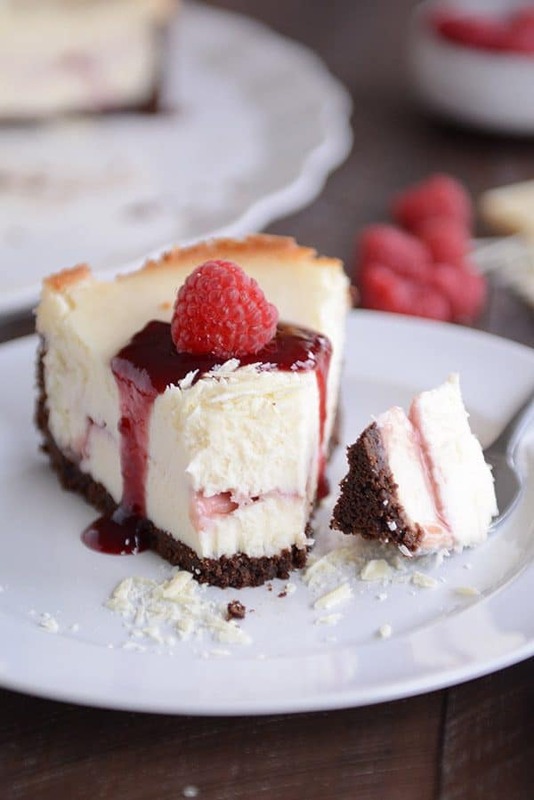 All in all, this stunning white chocolate raspberry truffle cheesecake is a dessert that will not disappoint. Rather, you’ll probably wow your friends and family to the extent that you’ll never be able to lead a normal life again as you spend your time deflecting compliments, cheesecake requests, and general fangirl/guying. Although if you are like me (extreme homebody who doesn’t like to put on makeup just to serve cheesecake), that fame-and-fortune possibility will have you, instead, whipping this cheesecake up to be enjoyed slice-by-slice any time of the day by your own little self. And ok, maybe doling out a piece or two for the other humans living under the same roof but only if they happen to catch you eating it at midnight by the light of the fridge. In a medium bowl, stir together the chocolate cookie crumbs, butter and egg yolk until well-mixed. Press evenly in the bottom and 1/2-inch up the sides of a 9- or 10-inch springform pan. Bake for 8-10 minutes. Set aside. In a small bowl, combine the chopped white chocolate and heavy cream. Microwave for 30 second intervals, stirring in between, until melted and smooth (don't overheat). Set aside to cool to room temperature. In the bowl of a stand mixer fitted with the paddle attachment or in a large bowl using a handheld electric mixer, beat the softened cream cheese until well-combined with no lumps. Add the sour cream, sugar, cornstarch, and vanilla, and beat until evenly mixed, scraping down the sides of the bowl as needed. Add the melted white chocolate/cream mixture to the cheesecake batter and mix with a rubber spatula or spoon until combined (don't overmix). Spread half of the cheesecake filling over the baked crust. Lightly warm the raspberry jam until it is pourable without being warm or hot. Spoon it in dollops across the cheesecake layer and use a butter knife to lightly swirl back and forth into the cheesecake. Spread the remaining half of the cheesecake batter evenly over the raspberry swirls. Place the cheesecake on a foil-lined baking sheet and bake for 40-45 minutes until the sides are set and the middle is just slightly jiggly. Remove from the oven and let cool completely. Cover with foil or plastic wrap and refrigerate until chilled, at least four hours or up to 24 hours. 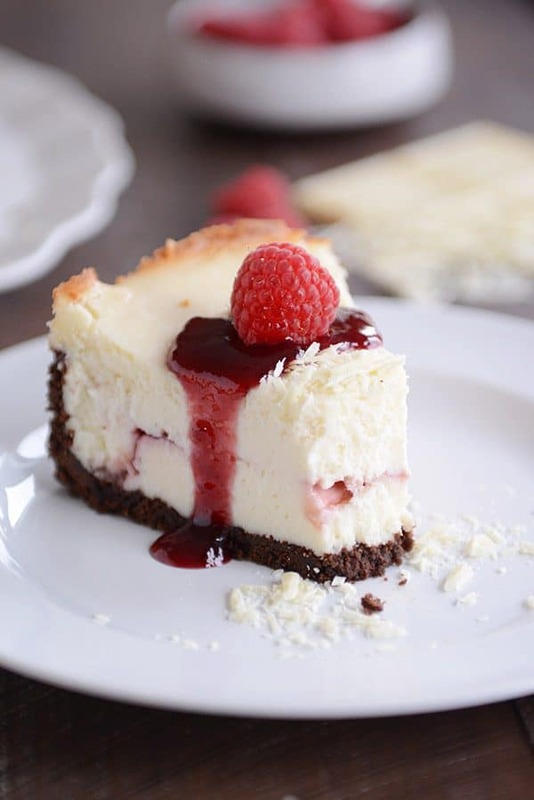 To serve, garnish the top of the cheesecake with the shaved white chocolate and raspberries, OR, slice into pieces and garnish each piece individually with the white chocolate, raspberries, and raspberry jam. For the chocolate cookie crust, I usually use Nabisco Famous Wafers, chocolate graham crackers, or chocolate Teddy Grahams. You can use Oreos, but for this recipe, I'd probably scrape out the white filling before using. You can definitely use raspberry jam with seeds, too, I just like the look and texture of seedless jam for this recipe. You could also get fancier than raspberry jam and make a raspberry sauce: 12-14 ounces fresh or frozen raspberries, 1/2 cup water, 1/2 cup sugar (plus more to taste, if needed), squeeze of fresh lemon juice, 1 tablespoon cornstarch. Add all of the ingredients to a saucepan, mix to combine, then bring to a gentle simmer and cook until thickened. Let cool before using (can strain out the seeds if you want it seedless). ﻿For the white chocolate (both in the recipe and for the garnish), I highly recommend using real, live white chocolate (I like the Ghirardelli white chocolate bars usually found above or near the chocolate chips). White chocolate chips often do not melt well and can clump. Don't mistake white chocolate for white almond bark/candy coating. That won't work in this cheesecake (it will be sickly sweet with a fake flavor). I made this for Thanksgiving and it was demolished! I chose this recipe because a family member doesn’t tolerate eggs well; I’ll make it again because it’s soooo delicious! I served it with a homemade raspberry sauce, and it was just perfect. Another winner from Mel. 🙂 Thank you! Thanks for the review, Mary! Staring to make this and realize I don’t have heavy cream . Any substitutes? Do you have half and half? You could probably sub that in for the heavy cream. Absolutely delicious! Made this for Easter. Did as 1 commenter suggested and swirled in the extra raspberry jam on top – and mine did bake 10-15 longer than the recipe called for. Will definitely make again. I have never made a cheesecake that didn’t call for egg in the batter – but this was the creamiest cheesecake I’ve ever made and it didn’t crack on top! Thanks so much for sharing this recipe. Mel, I mad this recipe for my in laws and they all LOVED it but now I want to make it in mini form for my sister’s baby shower. How would I adjust the baking time/temp if I made this in a muffin tin? I would probably bake them for 15-17 minutes. 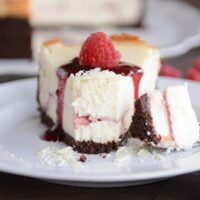 I’ve made so many of your wonderful recipes and have loved every one of them.i really want to make this cheesecake but Ghiradelli white chocolate is pretty much impossible to find in Canada. Would a brand called Bakers work for this? Note to self..bring back chocolate next time I’m in the US! Yes, the baker’s brand would work just fine! (Just make sure it isn’t almond bark or candy coating; as long as it is the real deal white chocolate, it’ll work). I bet it was gorgeous! I made this for Christmas Eve and it was fabulous! I honestly had never seen a baked cheesecake without eggs before and had no idea what to expect – but it was just perfection. I did take the extra step of making homemade raspberry sauce, which is super delicious and worth the trouble for SURE. Served with chocolate shavings and freshly whipped cream, along with extra sauce drizzled on top. Loved it!! Thank you! I bet it was over the top with that homemade raspberry sauce! I made this for Christmas, which is also my mom’s birthday. The birthday girl loved it, and I agree–this is one of the best cheesecakes I’ve baked. The crust was a bit crumbly but the cheesecake part was so smooth and rich. Hard to believe it didn’t have eggs. Will gladly make it again. Thanks for another winner! Could you make this in your instant pot? I’m sure you could – but because you’d need to use a smaller pan, the ingredients would need to be reduced. Is it ok to add the raspberry topping & chocolate curls a few hours ahead of time? Yep, that should work fine! This cheesecake is AMAZING! My husband and I ate the entire thing ourselves in three days. So, so good. I used chocolate graham crackers for the crust and will try one of the other suggestions next time, but still, it was fantastic! Thanks, Mel! I’m so happy you loved it, Katherine! Thanks for commenting to let me know! I made this for our Christmas eve dinner and it was amazing! It was my first time making a real cheesecake and I didn’t have any problems. Thanks Mel! I just popped this into the oven and am so excited to serve/eat this later this evening. I haven’t ever left a comment, but as I have used your recipes almost daily for years (literally) it’s about time I say thank you! I am so appreciative of the time and effort you put into perfecting and posting recipes. It has helped me feed my family better food on a smaller budget and made mealtimes so much happier. You are my recipe fairy-godmother! Merry Christmas! I made this yesterday for our Christmas dinner dessert. The directions were easy to follow and not challenging. Love it! Everyone had a piece even those who usually pass on desserts. Some even mentioned it’s as good as TCF!!! Thanks Mel for another no fail, easy to make, Yummly recipe! Quick question. Does the cheesecake batter need eggs? I just wanted to make sure before making. Thanks in advance. Quick ? – though with it being Christmas Eve and my cheesecake in the oven I may have to wing it…..
At what point do you remove the springform pan ring? After it cools in counter, after it’s been completely chilled in the fridge, or right before serving (24 hrs in my case)? Sorry for the delay, Sara (I wasn’t checking comments during Christmas to spend time with the fam). I take the ring off after it has chilled and right before I serve it. Hope it worked out ok! So do I not need to add water to the baking sheet? I just put the springform pan right on the foil lined baking sheet? Thanks in advance! I’m going to attempt this tonight. This is the first cheesecake I’ve ever made so I’m nervous!! Hi Lindsay – I don’t use a water bath – should be fine! How did it turn out? So I decided to make this for Christmas dinner dessert to take to my in laws because it looks so Delicious! This is my first cheesecake I’ve ever made…I know I probably shouldn’t have done that since I’m taking it somewhere… I baked it the 45 minutes and it’s still really jiggly. Is that normal? Help!! Mine is super jiggly too. I am doing a trick I learned somewhere else where you turn the oven down to 200 for a few minutes after the original baking time and then turn the oven off and let it cool down in the oven before taking it out. That’s supposed to help. I guess we’ll see. I have no idea what I’m doing. Hey Hannah – how did it turn out (sorry for the delay in responding!). If it’s really, really jiggly, you can add 10-15 minutes more to the baking time, but because this doesn’t have eggs in it, you can take it out even if it’s still a little jiggly in the center and it will set up as it cools and chills (better than overbaking it!). Made it and we all loved it! Thanks for another great recipe, Mel! I’ve been busy trying several cheesecake recipes over the last few weeks (Cream cheese has been on sale.) Every time I make a new recipe I evaluate it at the end and see if there’s anything I did wrong or want to change, etc. I didn’t realize I usually do this out loud while we’re eating it. Being my own food critic, I guess. My oldest son said last night when he was eating his slice that ‘nothing went wrong with this, it’s the best cheesecake so far’. He then went on to describe how creamy and smooth it is. I used jam with the seeds still in and it was fine. I was just too lazy to strain it. However, this specific jam doesn’t have many seeds and is less sugar than other brands. I also wanted to make a recommendation on the white chocolate. If anyone has an Aldi store local their white chocolate bars (Choer is the brand) work really well and out here are less than half the price of the Ghiradelli bars. I was so happy to discover this! The taste is fantastic and they melt beautifully. Oh man! This looks so good, I’m making it for our Christmas dessert! Question on the chocolate, I bought the guitard white chocolate meltys that are the discs from winco bulk section… will that work? If not I’ll go back for a bar! So worth it. Hah! Side note, right now My Trader Joe’s has 4 pound plus bars for $15…. so now I’m the proud owner of one of those bad boys! Hah! Hey Katherine – I hate to send you back to the store, but I would definitely suggest the white chocolate bars (“real” white chocolate) vs the chocolate melting discs. Exciting about the pounds plus bars – love those things! Thanks for responding! I’d totally rather go back to the store than be disappointed! Merry Christmas!!! Can I sub seedless raspberry jelly for the jam? Could you substitute seedless raspberry jelly for the jam? I’m not sure what the differences it would make. I have a newborn and wanted to do a tiramisu for our Italian Christmas Eve dinner…but too complicated! This looks much easier with the same wow factor. Thanks! Hope you love it if you try it, Diane! A bit off the subject here. You once mentioned a super cleaner by Dawn but I can’t find it now. Could you remind me? Hmmm, I’m drawing a blank, too, Beth. Do you know how long ago that was? I’ve never made homemade cheesecake that I can remember, I might have to change that and try this recipe! I love when you link the products, makes it easy to order the things I need and I love to know what you actually use. I’m just finishing up your peanut blossom cookie recipe now, yum!! I wonder about making this in bar form. That seems to work better than in pie form for coffee hour at church. Any thoughts? Hey Beth – I think it would work! Probably an 8X8- or 9X9-inch pan is my best guess! I plan to make this fabulous cheesecake this weekend. However, please suggest an alternate crust as one of my guests cannot eat gluten. You might try to look for a gluten-free cracker – otherwise, I’m not sure how to make the crust gluten-free. Seriously!? I think you’ve finally outdone yourself this time, Mel. You can sit back rest assured you’ve given your readers a very Merry Christmas present wth this one!! The Cheesecake Factory version of this is my husband’s absolute favorite dessert in the history of ever. I’ve just read through all your instructions and ingredients. And… You actually make it sound so doable! Thanks for all the notes and tips about which cookies and chocolate, etc. I’m not a cheesecake maker, usually. But, I’m going to be adventurous and try this for a Christmas day dessert–a special gift for my man. Yay! Thank you! ❤ I’ll report back and let you know how it goes. You are a great wife to do that, Kamber! You’ll do great! Let me know how it goes! Yum! Wondering if this could be made in bar form? I want to offer an assortment of bars for Christmas Eve dessert but reaaally want to make this cheesecake recipe. Thanks for sharing all your great recipes! That’s a great question – and I’m sure it could! Just based on the area of the pans, I’d say this could be made in an 8X8- or 9X9-inch pan, maybe? Have you tried making cheesecake in the InstantPot, yet? I made one of Marci’s recipes a few weeks ago. It was SO easy and turned out perfectly. I’d love to try to adapt one of your cheesecakes that way. The pan that fits in my IP is 7″, so I know I’d have to scale down the filling a bit. Love to hear your thoughts! The more I use my IP, the more I love it! It’s been a game changer in my kitchen! Hey Kim! I have tried that…I made a lemon cheesecake from pressurecookingtoday.com. That’s my biggest beef is that I have to use a smaller size (which is great for serving just my family but not so much for company). I also had to invest in a separate silicone ring and pot for when I want to make non-savory recipes (the first time I made cheesecake, it tasted like chili which was icky). Have you done that? This looks divine! Would you say it’s a decadent and rich cheesecake? Like you can only have a small sliver of it? Yes, I definitely think it’s similar to the richness in your average cheesecake. Having said that, I served it to a crowd and some people had a fairly large slice while others just wanted a thin slice, so it may depend on the eater! Oh noooo, now you’ve done it! I just added all the ingredients needed for the peppermint bark cheesecake to my grocery order. But… but this one looks amazing!! I haven’t made the peppermint bark one before. I think my husband would prefer raspberry, but peppermint is so Christmasy. What to do?! It’s an impossible decision, I know, Megan! You can’t go wrong with either!